Tre'Davious White and his teammates want revenge on Rob Gronkowski. Gronk was suspended one game for a dirty hit on White after a play in the fourth quarter where the cornerback intercepted Tom Brady. But the suspension and apology from Gronk isn't good enough for the rookie. "The whole hood want 'em." 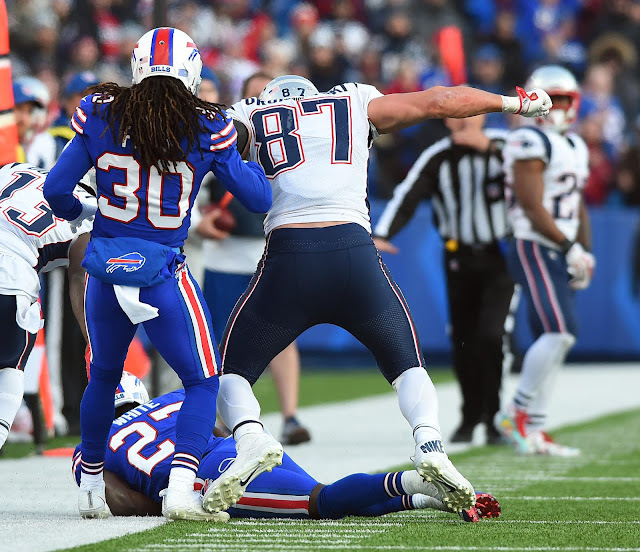 What did Tre'Davious White text to our Ryan Clark about the Gronk hit? I think everyone is in agreement Gronk was way out of line for this and, at least in my mind, deserved to be suspended. White suffered a concussion as a result of this and you'd be a sick-minded POS not to feel bad for him. Now an entire team wants to take Gronk's head off, and I kind of can't blame them for feeling that way. Whether they actually do anything about it is another story, but the idea that it's even being talked about like this should be nerve-racking to at least some Patriots fans. By Week 16 the Bills may be completely out of the playoff picture, as they're on the outside looking in at a wild card spot right now. In theory, they will have nothing to play for. So taking shots at Gronk and potentially injuring him to the point where he'd miss time is definitely a real possibility if we're to take White's text at face value. I don't even need to say it but I will - the Patriots need Gronk to stay healthy, especially this year because they don't have a solid No. 2 tight end behind him like they did with Martellus Bennett last year, if they want to repeat. Maybe this is an overreaction on my part, but either the Pats need to do everything they can to protect Gronk moving forward, or someone from the NFL has to step in and say something and get control of the situation. If nothing is done, it could get real ugly. Imagine possibly having Dwayne Allen as your No. 1 tight end moving forward. If that doesn't make you cringe, nothing does.